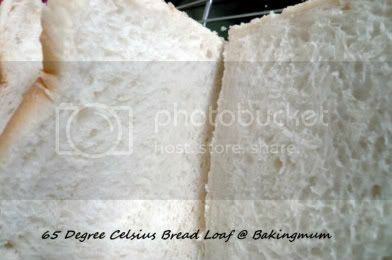 Finally I can get down to this 65°C TangZhong (湯種) method bread loaf which was the talk of the town for a while. According to Florence, who has so generously shared the recipe, bread made using this method results in a soft and bouncy bread that keeps well too. The bread is very soft and the taste is great. 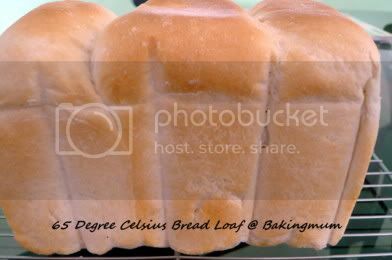 Just right after baking, among the kids and the hubby and the domestic helper, they nearly finished the whole loaf in lightning speed. They ate it with butter and strawberry jam and said it is very nice. There is nothing that beats freshly baked bread that is just out of the oven.